Collar Neck Size: 6" - 23"
If you are on a budget, this is the wireless fence for you. The battery on the PIF-300 collar receiver is replaceable and cannot be charged; it will last for approximately 2 to 3 months, depending on your dogs temperament and how often he challenges the containment boundaries. While replaceable batteries are not as convenient as a rechargeable receiver, they do have a significant upside: if the battery were to malfunction, you can replace it manually – this is not possible on a rechargeable receiver, as they come with built-in batteries which can only be removed by an authorized service representative. The receiver functions with PetSafe’s 6 volt Lithium batteries (RFA-67), which can be purchased for around $7.5 for a pack of two. Unfortunately the PetSafe PIF-300 does not come with a probe wrench, so you will need to screw them in and unscrew them by hand. This isn’t a big issue, however be careful to do it gently so the probes do not dig into your fingers, and also to check periodically that the probes are still tightly screwed in, as they tend too loosen up slightly after a week or so of use, especially if you dog loves to run around and jump alot (and which dog doesn’t like that?). It might also be a good idea to use pliers to attach and remove the probes. The test light that comes with the PetSafe PIF-300 is different than what you get with the Safe & Play model, for example. Rather than having to simply bring the tester close to the receiver to check if it is working, you will need to attach the tester cables (leads) beneath the contact points; if the receiver is working properly and a working battery is installed, the tester light will flash each time the receiver approaches the boundaries. Use this to find the exact locations where the boundary flags should be inserted for training your dog with visual cues. As with all quality wireless dog fences, the PIF-300 package comes with two pairs of contact points: long and short ones. Your choice of which pair to use will be determined by how long and thick your dog’s hair is around the neck area; if it’s long and thick, use the long contact points. If it’s short and thin, use the shorter ones. 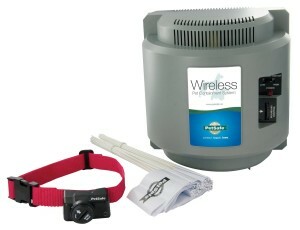 PetSafe issues a limited lifetime warranty for all their wireless pet fences. “Limited” in this case means the following: you get a full 1-year long warranty, after which you get a lifetime major discount on all repairs which might need to be carried out in case of a transmitter or receiver malfunction of any sorts. The PIF-300 transmitter is rather large (9” (L) x 9.1” (W) x 8.9“ (D). It needs to be installed on an outer wall inside your house, on the ground floor, and around 4 to 5 feet from the ground. Make sure to keep any metal objects at least 3 (and preferably 5) feet away from the transmitter to minimize signal disturbances. Remember the transmitter will emit a radio signal in an almost perfect circle, so wherever it is installed will mark the center of your containment circle (the Pet Area). As with all wireless transmitters, you can either place it on top of a table, or mount it to a wall using the included back assembly. In case you place it on a table or another object, make sure that the object is not made from metal, and that nothing is placed on top of the transmitter (no keys, documents, etc.). Also, the transmitter should remain in an upside position at all times. The boundary signal strength switch. You can set this to either LOW or HIGH; use the former if you want to create a containment area with a diameter of 90 feet or less, and use the latter if you want a larger containment area (90 to 180 feet diameter). 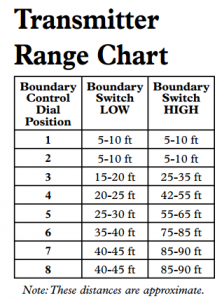 The boundary control turn-dial. This can be set to a value between 1 and 8; the higher the value, the larger the containment circle will be. 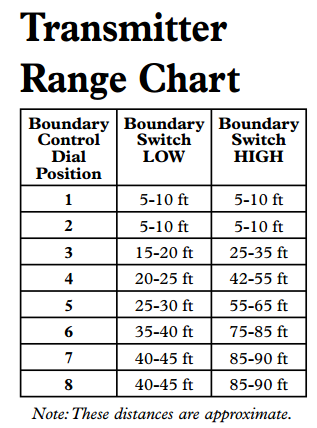 Keep in mind that how much further you extend the boundary with each turn of the knob will depend on whether you have set the signal strength switch to LOW or HIGH. The PetSafe PIF-300 has a slightly worse boundary stability than the PetSafe Stay & Play or the Havahart Radial 2 models. At the maximum setting (180 foot circle diameter), you can expect the perimeter to wobble approximately 3 feet in any direction; so a setting of 180 feet will actually be between 177 and 183 feet in real life conditions. This signal instability is significantly reduced if your containment area is smaller than 180 feet in diameter. Overall, I consider this a very stable wireless fence, though the other two models we’ve reviewed here are a little more stable. The PIF-300, as with all other PetSafe wireless systems, can support an unlimited number of dogs without the need to purchase additional transmitters. You can buy as many collars as you need at an average of $90/collar and they will all work perfectly fine. In case you need to cover a larger or non-circle-shaped area, you can buy an additional transmitter and have the two work together, allowing you to contain your dog in an area resembling an “8” shape, or something closer to a rectangle. The receiver collar will fit any dog with a neck size of 6″ to 23″. The short contact points are installed by default, and you’ll likely need to use a wrench if you want to replace them with the longer pair. There are a total of 6 correction levels available: 1 is the beep-only, and the other five are a beep plus one of five static correction intensities. By default, the receiver on your collar will be set to “1” (beep only). To change the correction level, use a coin or a screwdriver to remove the small plastic protection cap which covers the Correction Level Button, then press the button once until the LED lights up – it will flash between 1 and 6 times, indicating the currently set correction level. To change the level, simply press the button as many times as needed; so a change from level 1 to level 3 would require two presses of the button, etc. If the level is set to 6 and you press the button, it will loop around and come back to level 1. The PIF-300 comes with a PetSafe 6 volt RFA-67 battery, which will last for up to 3 months of use and costs less than $4 a piece. There is no need to open any tray to insert the battery; PetSafe designed the batteries for easy installation, and you can basically just screw them into the receiver directly using a coin or a flat-head screwdriver. Make sure to always have at least one back-up battery available. When the receiver light starts flashing red once every five seconds, this will indicate a low-level battery and you need to replace it asap. In case your dog were to approach the containment zone boundary and not retreat despite a static correction being delivered, the receiver will stop correcting your dog after around 30 seconds to avoid stressing out your pet for a longer time than necessary. Once the system is set-up and ready for use, you will need to train your dog. Please refer to our detailed step-by-step tutorials on how to do that properly and without over-stressing your pet. A great purchase for anyone on a budget; as far as wireless dog fences in this price range go, you won’t find anything better than the PetSafe PIF-300. Check Amazon.com’s price before you decide whether to buy it or not.